It may happen that you would like to stop sharing a video. In this chapter we will explain how you can retract a video. 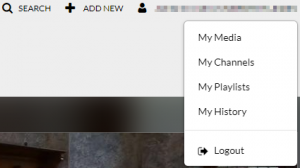 Click on ‘My Media’ in the user-menu. 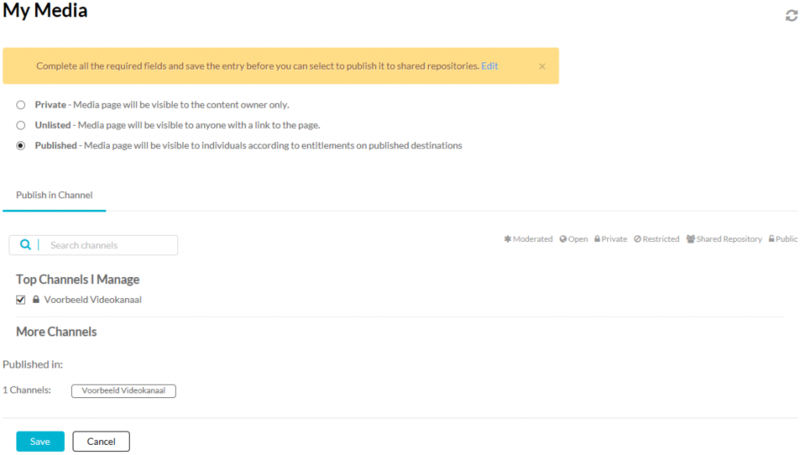 Select the video’s you would like to un-publish by ticking the boxes in front of the applicable video’s (Shown by the arrows in the example below). Click on the ‘Actions’ menu to expand it (on the right hand side of the ‘My Media’-page). 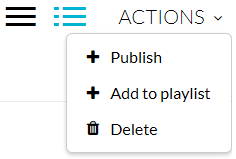 Click on ‘+ Publish’ within the expanded ‘Actions’-menu. | NB: un-publishing works through the same button as publishing a video! Remove the tick for the channels you wish to un-publish the video’s for. Or click on ‘Private’ to un-publish the video for everyone except yourself. When un-publishing was successful a green information-bar will appear.